and you might be able to tell what these pictures are of. Over the last few months I've been trying to used my DSL camera more. Really that means learn how to use it. Last night I found out the importance of having a tripod for night photos. Dad and I left the el-sicko mom at home and drove down to the harbor to watch the parade of boats. Lots of fun, but chilly, and I was ticked I didn't think to bring a tripod. Dad's head wasn't steady enough. Here's my extremely blurry picture of downtown San Diego. And I'll only torture you with one photo of decorated boats. Just imagine almost 100 different sized boats of all types (sailboats, party barges, trawler, dingy's, huge cabin cruisers) all decorated, and some with music, slowly parading past us. Oh, and there was one kayaker at the very front. He got the loudest cheers from the crowds on the shore, at least in the section where I started the cheer! I got brave today and did some finishing on a few things I stitched last year. No clue why, but I was totally petrified of doing the finishing for the BBD stockings. I didn't follow the instructions in the book. Instead, I chose to machine stitch them and make them as semi-functioning tiny stockings. I know these are from the December monthly stocking books BBD did, but of course that's the one month I didn't bring with me so I don't know the specific names of each one. Guess I'm not stitching them again anytime soon either. I'm totally amazed at how many people actually read my blog, just by number of comments left for the giveaway and the new followers I picked up. It works both ways actually, I found some new blogs as well! Still plenty of time to enter, just leave a comment on the Giveaway post and make sure you're a follower! I'm slowly falling behind in my blog reading, so I find I'm leaving comments on post 2 or 3 days ago, and then later see there's a newer post. I'm slowly reaching the point where I'm just going to have to skim blogs and forgo the commenting just to catch up. Hopefully that doesn't happen. Off to make dinner, since Mom seemed to come down with the crud on Friday and its still hanging around. Dad seems to take the position that if there's an able-bodied female in the house, then he doesn't need to take any part in fixing meals. I squinted and imagined....no problem. And, those BBD stockings are just perfect! The first time I finished one, I was the same way. I love them!!! What fun with the boat parade! Squinting works. 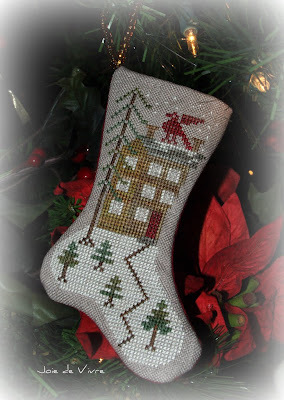 :D Love your BBD stocking finishes! They're beautiful! I hear you on finishing though. I'm always petrified of doing it. lol! Looks like you and your Dad had fun! I hope that your Mom is feeling better. Pretty lights and even prettier stockings. You did a great job with those. I sure hope your mom doesn't have the same crud I had. A week later and I am still coughing and hacking. I hope she feels better soon. Those photos actually looks like paintings~ Very interesting!!!! 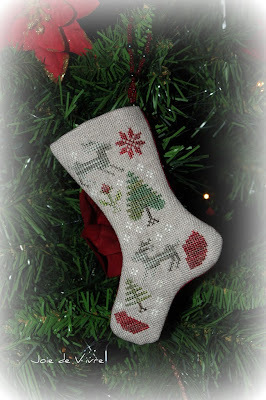 I love your stocking finishes, they are gorgeous!!! That damn crud that is floating around just don't go away!!! My husband has been coughing for weeks now.... Hope it won't take that long for your mom to recover!! Lovely stockings! Mindi, I'm more a lurker than a follower but I do read your blog so keep it up please! Love your stocking finishes! 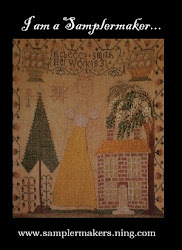 I stitched one last year but was a complete coward about the finishing and sent it off to Deb!!!! Your pics remind me though that I really want to stitch the other two from that booklet. Maybe 2012! Squinting worked - what a show of lights and boats. Your little stockings are just gorgeous. The BB stockings are sooooooo pretty. Love the one with the tree and reindeer. Lovely job on the stockings...I think they turned out perfectly!! Hope your mother feels better soon...and Merry Christmas! Hello Mindi thank you for becoming a follower of my blog. I have enjoyed my visit to your blog and have become a follower. I too like Dunnett and Galbadon. Have you read any Sharon Penmaen. Very pretty stockings. And ... yep ... that's how blog reading goes! I think your pictures are very artistic. What a fun time it must have been. Love the stockings - very pretty! 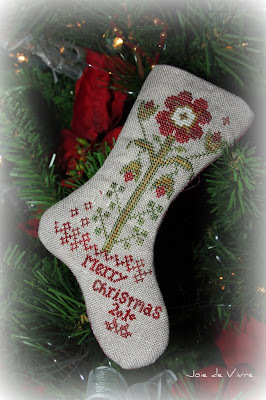 Your stocking finishes are lovely Mindi. I bet you and your Dad had fun. I'm pretty useless with a camera other than taking photos of my stitching! I hope your Mum is better soon. I love those December socks! Have added the pattern to my every growing want list! Thanks for the give away! These stockings are gorgeous. Lovely finishing as well. Looks like you and your dad had lots of fun and hopefully your mum is feeling better by now. I know just what you mean about being afraid to finish the BBD stockings, Mindi--I'm the same way. But seeing how well yours turned out gives me the courage to (hopefully) do one in 2012!! I do hope your mom is feeling better soon--not a good time of year to be sick. Sweet finishes! They look great! I did one from the booklet (and promptly had the red color run when I got it wet with the iron...) and hope to get to the other two soon. Lovely finishing!